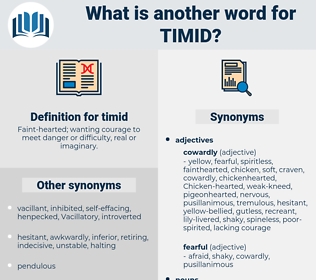 What is another word for timid? Faint- hearted; wanting courage to meet danger or difficulty, real or imaginary. fearful, prudent, careful, reluctant, moderate, humble, wary, weak, slight, afraid, delicate, feeble, conservative. 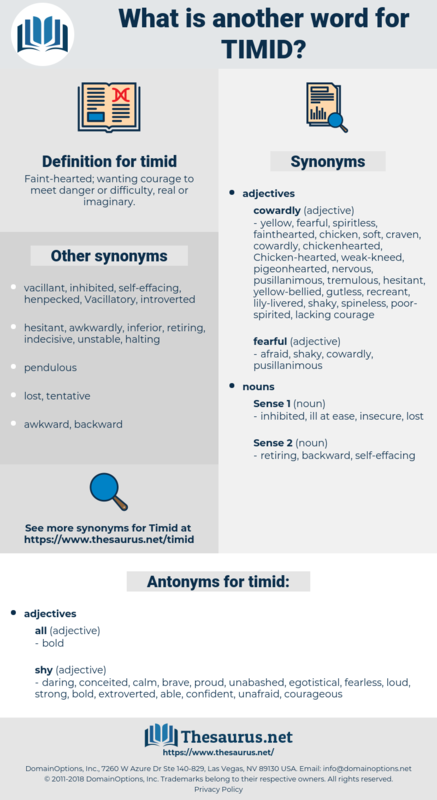 shy, modest, reticent, tentative, hesitant, cowardly, Half-hearted, self-conscious, over-cautious, circumspect, restrained, sensitive, coy. brave, confident, unabashed, extroverted, daring, courageous, unafraid, conceited, egotistical, fearless, able, loud, proud, calm. fresh, mettlesome, temerarious, intrepid, bright, sturdy, brilliant, hearty, game, unflinching, firm, unswerving, resolute, spunky, energetic, nervy, undeterred, clear, conspicuous, plucky, strong, determined, spirited, vigorous.
" He knows very well that you are not little and timid like me. The smile that came on her face was sad and timid; yet it was a smile of hope.